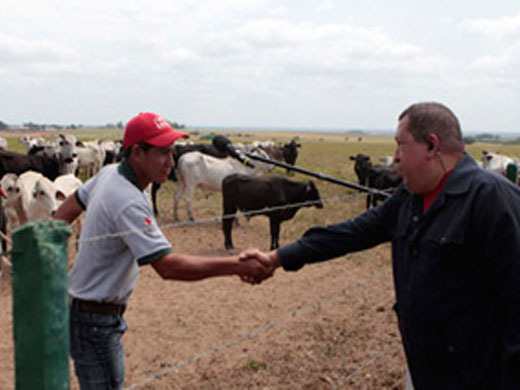 Let's face it, Chavez agricultural policy has failed. So he finds nothing better but to accuse the main three private banks of Venezuela of not financing the agricultural sector and threatens to nationalize the three of them. The news went around fast, in Spain where BBVA headquarters are, and elsewhere, such as a misleading BBC snippet that makes the casual reader think that Chavez policies are working. Reality is complicated. As a businessman making his livelihood in the agricultural sector I have indeed benefited from the credit policy of Venezuela which demands that 24% of bank loans go to finance agricultural activities. This is great for me and my colleagues because the interest rate is fixed at 13%, 2 to 5 points below the other markers. With an official inflation at around 30% and a real one maybe getting close to 40, this means that by the time we have paid our loan, in real money we may have made as much as 10% instead of paying interest. As a matter of fact, even agricultural business that do not need to borrow to grow still borrow, if anything to buy dollars outside of Venezuela, or to enjoy an easy bonus because you could lend that money at a higher rate than you borrowed it. There is another perverse effect: banks court us. That is, since agricultural activities are such a high risk activity in Venezuela, anyone that is known to pay back his loan, even late, even with trouble, is an AAA of sorts in the informal credit rating of the Venezuelan banking system. Your banker will call you to ask you whether you need money. You can demand conditions. And when the loan is approved the banker comes to your office with all the paper work and the public notary to sign. Approval is easy: take your banker to an outing on your farms and show him your property titles. That is enough, you do not need even to do complicated financial statements (your banker knows how much money you make) or to draw proposals and what not: you have enough guarantees as far as the banker is concerned, considering the conditions of the country. But this system only benefits well established agricultural farms and agribusiness concerns. They cannot make much money these days because of the rigid policy of price control of the regime. But thanks to the indirect earnings that the mandatory loans offer us, an earning that does not appear in any accounting book because it is courtesy of inflation and thus we pay no tax on that, we can develop, invest, grow. I can assure you that at least 50% of any new investment in the agribusiness sector you may observe comes from these loans that the banks are forced to make. In my own business all growth that may come for us is due to banks wanting us to borrow from them. And the ultimate perversion is that if you are in an agricultural sector threatened with expropriation by the regime, then you have more reasons to borrow: the day you are expropriated the debt goes to Chavez whereas whatever you spent on you remains with you. Of course banks are very reluctant to make loans to small farmers, in particular those that Chavez is allegedly creating with all the intensive land expropriation to allegedly create small farms with landless peasants. The problem with Chavez ideological hare-brained schemes is that those who receive the land do not get any property title and thus have no asset to offer banks. And no real prospect for success anyway as the government merely hands out money and land but provides no services, no consulting, nothing worthy or continuous over time. After all we just learned this week that the per capita agricultural product went down 9% since 1998 in spite of all the money and laws and programs that Chavez has thrown at the sector. Banks are not picky as you already read, but at least they require either an asset or a guarantee from the regime that it will put up if the worst comes. A Chavez running out of money is certainly not going to oblige, even if he were inclined to do so. But Chavez also knows what is going on with these credits, who really benefits from them. So he gets furious and decides to punish the victim, that is the banks who make nothing out of these loans, by threatening to expropriate them through what is nothing more than a crass extortion. He even suggested that the banks should deposit their 24% money in a state fund that will decide who gets the loans! You can kiss goodbye that money which is simply going to become grant distribution and vote buying in the country side at the bank expense, and the agricultural production expense which needs a large part of these loans for day to day routine as the investments must be done in full well before the crops are sold. If the banks go bankrupt from losing 24% of their capital, who cares!? After reelection Chavez will nationalize them once and for all. And yet there is a funny paradox: SUDEBAN, the state organization supposed to enforce bank regulations emitted a communique on January 23, a mere week ago, to the effect that the banks were fulfilling agricultural loans at 91.67%. I am not saying it, it is reported in the state news agency! In fact SUDEBAN self congratulates for the success! So, who is a liar? Chavez or Sudeban? The more to believe that today's whole show was an excuse to take away a large chunk of private money in the banks to finance Chavez reelection. And a true expropriation without compensation it will be, a plain highway robbery, "robar" as Maria Corina Machado so aptly put to Chavez on Janaury 13. Well, he'll show her.